It doesn’t matter if it’s basketball, football, hockey, the Olympics or any sport, my husband Bill always wants something to munch on while watching a game. It can be nuts, chips, ice cream, or cookies (his favorite by far!) as long as it is just for the game. It’s become a tradition around here for me to ask him what he wants for his Game Day treat. For the Loyola Final Four game last week, he decided a cookie with something chocolate were in his taste buds. Loyola sadly did not make it to the end, but the bar cookies were a winner! A crispy buttery crust is first patted into a 9-by-13-inch pan and baked for 10 minutes. It is taken out of the oven and the crust is sprinkled with a bag of chocolate chips, put back into the oven for 2 minutes to melt the chips, then spread evenly around the top. Next a pecan layer is spread on top and baked again. When done, the bars are sprinkled with confectioner’s sugar. Heat oven to 350 degrees. Grease a 9-by-13-inch baking pan. In bowl of electric mixer, cream the ½ cup butter. Beat in the egg yolk and water and mix well. In a separate bowl sift together the flour, 1 teaspoon sugar, baking powder, and salt. Add to the butter mixture and mix well until it forms a stiff dough. Pat the mixture evenly onto the bottom of prepared baking pan. Bake for 10 minutes. Remove the pan from the oven and sprinkle the bag of chocolate chips evenly over the crust. Return the pan to the oven for 2 minutes. Remove the pan again and carefully spread the melted chips evenly on top. In the same mixer bowl, beat the 2 eggs until thickened. Beat in ¾ cup of sugar and blend well. Stir in the 6 Tablespoons melted butter, nuts, and vanilla. Mix well, then pour evenly over the chocolate layer. Return pan to oven and bake for about 30 to 35 minutes or until a light golden brown and the dough springs back when gently touched in the center with your fingers. Cool pan on wire rack, sprinkle the top lightly with confectioner's sugar and cut into bars. Makes about 4 dozen bars. And they should go crazy- what a game! Bill was rooting for Villanova, if it couldn’t be Loyola. I hope to try these bars-I would probably leave OUT the nuts as there are people who are sensitive to foods with nuts. These treats really sound delicious! Dawn, I don’t think the recipe will work without the nuts. There are 2 cups of them and they are the majority of the topping. The other ingredients for the topping are just eggs, melted butter, and sugar and basically bind the nuts to make the topping. The topping holds in the melted chocolate pieces too. Without the full nut mixture on top of the chocolate, it wouldn’t bake properly. If you think of some way to make it work without nuts, please let us know! Yum! This recipe definitely looks like a winner! But I love anything with nuts. I will be making these soon. And so simple!!! You will love them, Kim! They are definitely easy to make and so good. I will have to try them soon. Love chocolate AND pecans. Thanks, Debbie. Thanks, Pat – hope you like them! Could she try something like oats instead of the nuts? Thanks, Jo – that’s a great idea! I was also wondering about coconut. If anyone else has other ideas, chime in! Thanks for writing, Jo. Hi Joy – Do you mean in place of the chopped pecans, because the topping mixture has to be used to cover the chocolate chips. If you try it with crushed chips or popcorn, I would love to hear how it turns out! This is the fun of cooking- trying new ingredients or methods. Thanks for the suggestion! 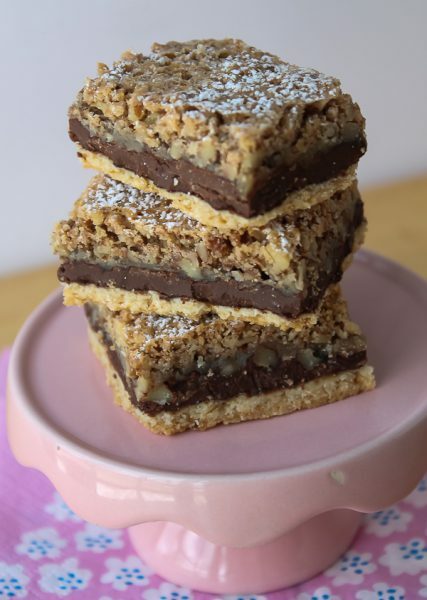 I admit that I’d made my own versions of these bars: #1: using cream cheese (4-oz.) and my own cookie dough base & #2: using 1 cup flaked sweetened coconut plus 1/2 cup candied cherries, finely chopped and my own cookie dough base. For me, these versions worked out very nicely! I also used a greased and floured 12×8″ baking pan instead of a 13x9x2″ baking pan. The smaller sized pan worked well for me. Sounds good, Dawn! Thanks for sharing.